KNF’s space-worthy liquid pumps are part of a new Life Support Rack for the ISS. Liquid pumps made by Swiss diaphragm pump specialists, KNF, were on board an HTV-7 unmanned cargo spacecraft which was launched from Japan on 23 September 2018. Destined for the International Space Station (ISS), the spacecraft and its vital payload successfully docked three days later. KNF’s first ever space-worthy liquid pumps are part of a new Life Support Rack for the ISS. 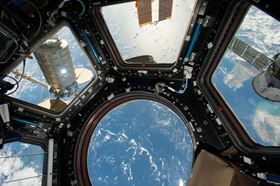 Also known as an Advanced Closed Loop System (ACLS), the rack purifies air and produces oxygen for the ISS. It was developed by Airbus Defence and Space for the European Space Agency (ESA). Engineers at KNF Flodos AG in Switzerland worked with Airbus for four years to specify and design the pump, which is based on KNF’s FEM 1.09 dosing pump. The project was part of the Airbus commercial off-the-shelf (COTS) programme, which uses well-established components to reduce the price tag for space flight. The new ACLS rack will be installed in the ISS’s Destiny module (also known as the US Lab) by ESA astronaut and ISS commander Alexander Gerst on 2 November 2018. The technology is critical for achieving the closed loop life support system necessary for human spaceflight beyond low Earth orbit. The two KNF pumps form part of an electrolyser that produces oxygen and hydrogen from water. The pumps transfer supply water from a plastic bag into the ACLS, a key job since the oxygen produced is used to replenish the cabin air. The ACLS uses a Sabatier reactor to further increase system efficiency and reduce water consumption on the station. The senior engineer at KNF Flodos in Switzerland, said, “Complying with the specifications for the COTS programme was an interesting and challenging task. We had to keep the key components of the standard FEM 1.09 pump to ensure it maintained its reliability and specifications but make significant design modifications." Atlas Copco is expanding its range of GA VSD+ compressors with a series of extra models that deliver efficiency in a space-saving upright format. The family-owned business is looking to the future.